Conserving space in a showroom is a must for displaying all of your merchandise in an orderly fashion! Keep your products and merchandise organized with this Black Slat Grid Screen! 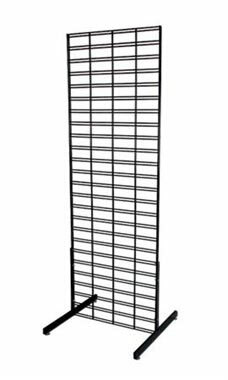 This Stand will help to keep things organized for tight retail spaces or to enhance your existing slat grid display. Choose this black Slat Grid Stand to add dimension and height to your showroom, along with a stylish appearance, thanks to the beautiful black finish. Measuring 2’ x 6’, this Grid Section provides a large amount of extra space for you to display your merchandise on. Great for attaching slat grid accessories such as peg hooks, baskets, or shelves, which can also be purchased separately through Store Supply Warehouse. In stock and available for immediate shipment. Bought these slat grid panels to use at outdoor events so I wanted something sturdy but not so heavy that they couldn't be carried around with relative ease. The slatted panels are stiff and take the wind very well (30 mph winds at the first event). They hold a lot of merchandise and I was quite happy with them. If I had to mention a negative, the legs are not near as sturdy as the panels themselves. I didn't want to have to put the legs on at the event so I put them on at home. With the legs attached, you (obviously) can't lay the panels down so to keep from damaging the legs in transit, I raised them up on a box so that they were off the floor. This worked very well. All in all, I would recommend these slat grid panels. I am planning to order some more. Very sturdy! Holds alot! Purchased to enhance my displays at events. Quick and easy setup!! Definitely a must have. With room to grow, I will definitely add more adaptable pieces! Leg stand part of this product could be more sturdy. An attractive and affordable grid stand for storing and displaying in my home my collection of newsboy caps. The less attractive Gridwall frame was initially shipped to me in error. However, Store Supply Warehouse very quickly acknowledged that error and shipped out the Grid Stand which I had ordered.